These beautiful cards are designed to assist those seeking to start on a personal ascension path or to accelerate journeys to the light. Each of the 52 cards offers a description of a specific ascension energy or Ascended Master, guidance on its use, and an affirmation to assist with assimilation of the wisdom. Through them, individuals will work with the gold and silver violet flame for transformation and to raise the energy in themselves and others, call in unconditional love, and draw on the elements to bring hope, peace, and love to the world. The subjects range from the 12 chakras and fire through Commander Ashtar and Mother Mary's aquamarine mantle. These cards may be employed in a variety of ways - such as a daily source of guidance and inspiration, a point of study for group discussion, a source for determining which areas of an ascension path require the most immediate attention, or a 52-step study course for ascension. Seekers may choose to work with the cards in order, to select one a week for a year, or to identify one card for intensive study. 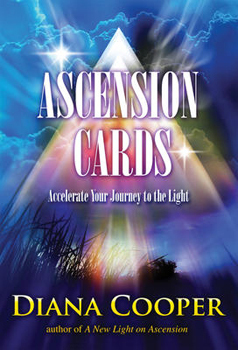 The accompanying booklet offers broader insight into ascension in general.